Spine poetry is a delightfully simple concept. Take a selection of books, arrange them in a stack so the titles flow when read one after the other, and there you have a poem! But is it really that straightforward? Occasionally I’ll glance at a pile of books and wonder what sort of poem they would produce. Often the answer is: ‘a very strange one’. 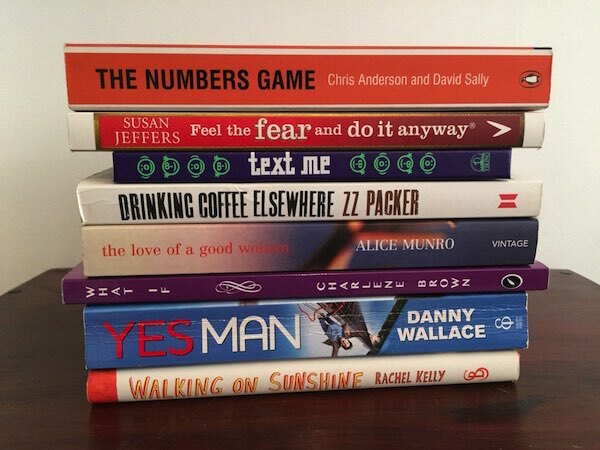 So, what’s the secret to successful spine poetry? Book spine poetry, as we know it today, is often said to have begun back in the 1990s with artist Nina Katachadourian’s ‘Sorted Books’ project. Over the years, many others have taken up the challenge of creating their own spine poems, including in libraries, in schools and online (#bookspinepoetry). Sounds straightforward enough. But is it the whole story? The ‘collection of books’ you start out with could be vast (like in a library) or relatively small (like on a bookshelf at home). When faced with either of these extremes, and anything in between, where do you begin? Spine poetry isn’t a game of chance; it’s about making choices. During my research on the subject, the concept of choosing titles that ‘interest’ you came up time and again. So, no matter how large the collection of books in front of you, the first step is to find titles that speak to you or intrigue you. Just as with any other type of creative writing, listen to your heart and build on what it tells you. Once you have a few titles of interest, you can find other ones that follow a similar theme. Perhaps they’ll spark an idea for a story (my spine poem below started out as a modern day love story); then you can search for titles to complete your tale. If you’re faced with only a small collection of books, it’s possible that you’ll reach a dead end. This happened to me with my poem below. The first bookshelf I looked at included too many textbooks, so I added another shelf – one with more fiction titles. Personally, I do like the challenge of having a select number of books to play with, but sometimes having choice is more fun. It’s worth mentioning here that spine poems are wonderfully flexible in terms of their length; some are made up of just three books and work very well. I love the fact that spine poetry is such a simple concept, and that it really can be quick – fitted in when you have a spare five minutes. But what I enjoy most is playing with the books themselves: pulling them out of the shelves, stacking and re-stacking them as if solving a puzzle, rediscovering titles I’ve forgotten about, or even discovering new books to read. My poem below might not be Shakespeare (perhaps truly successful spine poetry takes a bit of practice) but I really did have fun! Have you tried spine poetry before? If you’re looking for a quick creativity fix then do give it a go. Or take a look at the other writing ideas on this blog.